Pack for a Purpose is delighted to hear about the Big Impact PfaP travelers continue to have at the schools in India supported by Ibex Expeditions. Read the heartwarming story below from Ibex Expeditions Executive Nanaki Singh. I thought I’d share this small but exciting news regarding donations made through Pack for a Purpose. Our directors, Mandip and Anita Singh Soin, recently visited two schools in Rajasthan while on a 10-day tour to the interiors with tour operator friends from around the world. Since they were personally carrying the donations from our last two visitors, they decided to deliver these to the needy schools at Ramathra and at Rohet Garh, which is close to Jodhpur. At Ramathra, they met with the principal, vice principal and staff of the Ramathra Village School as well as the children who were very excited seeing so many people visit their school. The donated school supplies will be given to the children over the next few days through games, competitions and races. 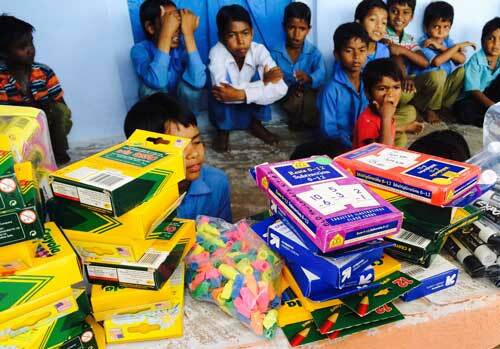 An additional bag of school supplies was given to our partners at Rohetgarh. Being a Sunday, they were unable to visit the school and the items were left in the trusted hands of the noble family who supports the school. On August 15, India’s Independence Day, they will hand out these items to the students as a big ceremonial event.